This case study demonstrates the effect of reduced nitrogen fertiliser rate and different row spacings on nitrogen losses. Increasing the time between fertiliser application and first runoff (allowing time for crop uptake and infiltration into the soil) is important to reduce applied nitrogen losses through surface runoff in ratoon cane crops. Un-degraded urea in runoff was a significant contributor to the runoff nitrogen loads. Moving from conventional to improved management practices (controlled traffic and to industry recommended nitrogen rates in Six Easy Steps) can reduce total nitrogen (N) lost in surface runoff by 32 per cent, with no change in net financial return. Every additional 21 days between nitrogen fertiliser application and first runoff, halves N loss (per cent of applied) to runoff. Un-degraded urea in runoff was a significant contributor to the runoff nitrogen loads. Applying nitrogen fertiliser at current industry recommended rates (Six Easy Steps) and increasing the time between application and first runoff can have substantial environmental benefits whilst still maintaining economic returns and in some cases, achieving financial savings. Applying fertiliser at rates above recommendations leads to nutrients surplus to crop requirements. This increases the risk of these nutrients being lost to the environment in runoff, which is not cost effective. This is particularly important if significant rainfall producing runoff occurs soon after fertiliser application. 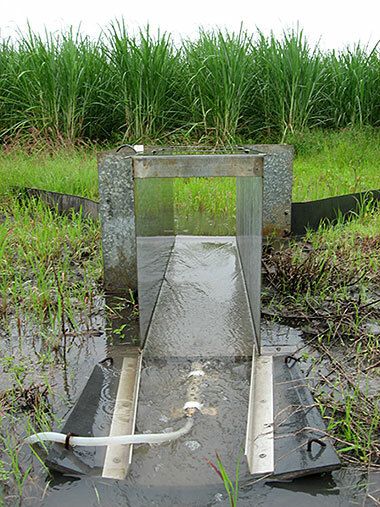 A paddock monitoring site was established in the Sandy Creek catchment, south-west of Mackay in 2009. The site,on a Victoria Plains soil (cracking clay), has two 1.1 hectare treatment plots under different farm management practices. The first treatment plot has 1.5 metre row spacings and conventional nitrogen fertiliser rates (~200 kg N/ha); and the second with the improved management practices of 1.8 metre row spacing (controlled traffic farming system) with a Six Easy Steps (6ES) fertiliser application rates (~135 kg N/ha). Rainfall, runoff, water quality, yield and farm operations were monitored across four ratoon crops from 2010 to 2014. Each plot was fitted with an automated surface water runoff sampling and monitoring station. Runoff samples were then analysed for suspended sediment and N, including dissolved inorganic N (DIN), dissolved organic N (DON), particulate N (PN) and urea, and total N (sum of DIN, DON and PN). Rainfall across the monitored years varied. It ranged from 3,190 millimetres between October 2010 and September 2011 (double the long term average) in the first ratoon to 1,390 millimetres between 2013 to 2014 over the fourth ratoon. The highest rainfall year had the highest N losses (average 11.5 per cent of applied N). Overall, the improved management practice treatment had an average 32 per cent less total N lost in runoff compared to the conventional treatment (Figure1). Both treatments had similar proportional losses(Figure 2). 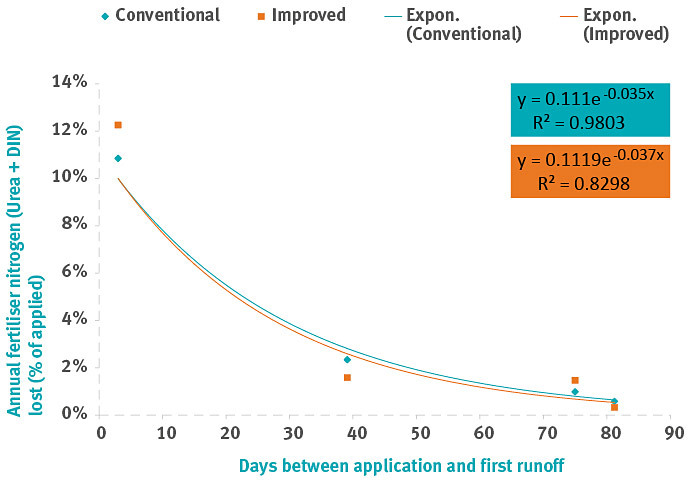 It was observed, that for every additional 21 days between N application and the first runoff event, there was an approximate halving of N loss (DIN and urea) in runoff (Figure 2). Similarly, N loss (DIN and urea) was also halved for every additional 95 millimetres of rainfall (or irrigation) between application and first runoff. Average yield across the cane cycle varied slightly, conventional treatment yield averaged 77 t/ha, while the improved management practice treatment averaged slightly less at 72 t/ha. A simple analysis of net returns (excluding irrigation, fertiliser other than N and fixed costs other than harvesting) showed both treatments averaged $2300/ha, with lower input costs for improved management practices offsetting slightly lower yields. Figure 1: Annual nitrogen losses in runoff from ratoon crops under conventional and improved management practices at Victoria Plains, Mackay. 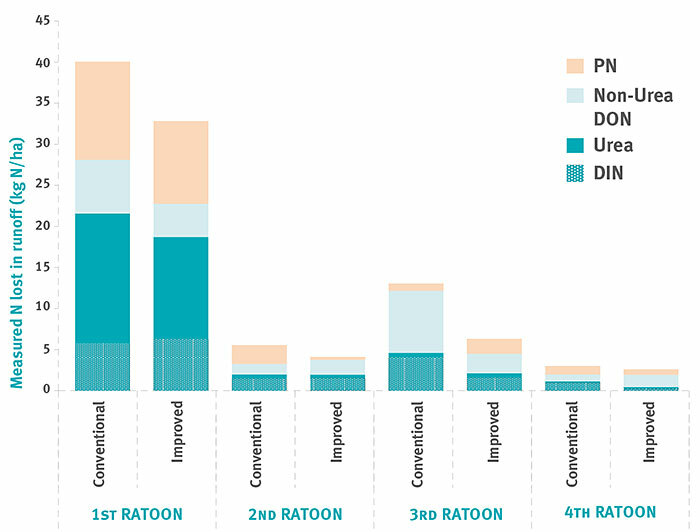 Figure 2: Annual fertiliser N (DIN and Urea, as a % of applied) lost in runoff from ratoon crops under conventional and improved management practices at Victoria Plains, Mackay. Stephen Donaldson and Ken Rohde, Queensland Department of Natural Resources and Mines, Mackay. Brodie, J. et al. 2009. Target setting for pollutant discharge management of rivers in the Great Barrier Reef catchment area. Marine and Freshwater Research 60: 1141–1149. Brodie, J., and J. Waterhouse. 2012. A critical review of environmental management of the ‘not so Great’ Barrier Reef. Estuarine, Coastal and Shelf Science 104–105: 1–22. Thorburn, P. J., and S. N. Wilkinson. 2013. Conceptual frameworks for estimating the water quality benefits of improved agricultural management practices in large catchments. Agriculture, Ecosystems & Environment 180: 192–209.